St Paul-lez-Durance in the highlands of Provence in southern France, the ITER project involves the European Union (including Switzerland), China, India, Japan, the Russian Federation, South Korea and the United States. 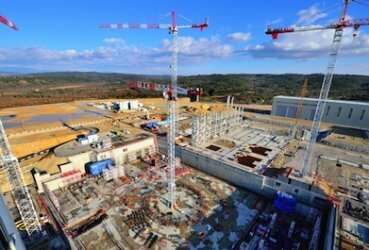 ITER is a critical step in the development of fusion energy : its role is to confirm the feasibility of exploiting magnetic confinement fusion for the production of energy for peaceful purposes by providing an integrated demonstration of the physics and technology required for a fusion power plant. At the core of the facility, the ITER ’tokamak’ is a toroidal confinement device in which a thermonuclear plasma of approximately 800 m3 in volume will be contained and shaped by powerful magnetic fields produced by some of the largest superconducting magnets ever constructed. The plasma will be heated by both particle beams and high frequency radio waves to temperatures in the region of 100 - 200 million K, producing the conditions in which the deuterium-tritium fuel will react, yielding up to 500 MW of fusion power. The presentation will introduce essential concepts relating to magnetic confinement of fusion plasmas, describe the principal characteristics of the tokamak, illustrate major elements of the ITER technology, discuss key physics issues which will be studied in ITER and summarize progress on the construction of the project. David Campbell is Director for Plasma Operation within the ITER Organization. Following a PhD at the University of Sydney, Australia, and a post-doctoral fellowship at the Max-Planck-Institut für Plasmaphysik in Garching, Germany, he spent 14 years at JET, the EU’s major fusion facility, at Culham in the UK, where he was responsible for various experimental teams, led the project’s plasma control group and, in 1991, was experimental programme leader during the first tokamak experiments using deuterium-tritium fuel. From 1996, he led the EU’s activities in physics and plasma engineering in support of the ITER design and R&D studies at the EFDA-CSU in Garching. He joined the ITER Organization in January 2007, and in 2011 took up the leadership of the Plasma Operation Directorate, which is responsible for managing the project’s physics research, the preparations for ITER plasma operation and for the overall management of the tritium breeding module programme.